Inno3D is readying for launch of the GTX 650 with its Gamer Extreme Edition graphics card which sticks to the reference specifications. The GTX 650 and GTX 660 both are upcoming GPU’s from NVIDIA which would launch on 13th September. The GTX 650 Gamer Extreme packs 384 cores featuring a clock frequency of 1059MHz and 1250MHz (5GHz QDR) for the 1GB GDDR5 (128-bit) memory. Display outputs include Dual DVI and a Mini HDMI port. The GPU features a dual slot cooler with a single fan which blows air towards an aluminum heatsink and hot air is ventilated out through the exhaust bracket. Inno3D is also preparing a reference model of the GTX 660 (GK106) which runs at 980MHz/1033MHz core and 6008MHz memory frequency. 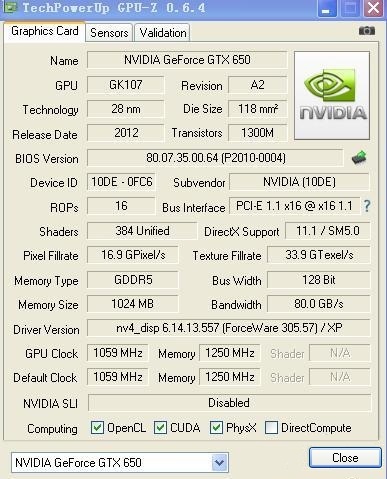 Exact model name is N66M-1SDN-E5GS and N65M-1SDN-D5CW for the GTX 650. Pricing would be $229 for the GTX 660 and $149 for the GTX 650.